Another fried chicken recipe with buttermilk, you will learn how to make fried chicken sandwich recipe easily. 3. In a medium bowl, combine all ingredients for seasoned flour. Dip the marinated chicken in flour until chicken is completely covered. 4. Heat the oil to 350˚F/180˚C in a deep pot. Do not fill more than half full with oil. Carefully fry chicken for roughly 7 minutes, or until cooked through (internal temperature should reach 165˚F/75˚C) and the chicken is golden brown and crispy. Drain on a paper towel-lined plate, or wire rack. 5. Heat a large skillet. Butter cut sides of the burger buns, then toast on hot skillet until browned and crisp. 6. Build sandwich with bread, lettuce, fried chicken, tomato slice, and dill dressing. 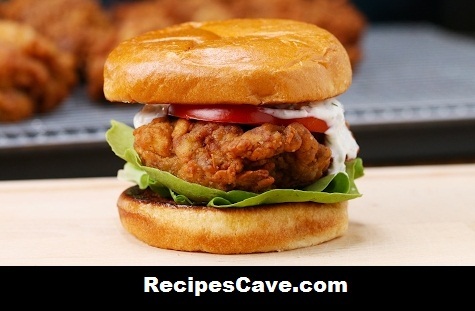 your Butter Milk Fried Chicken Sandwich Recipe is ready to taste.